Java Software Solutions establishes a strong foundation of programming techniques to foster well-designed object-oriented software. Heralded for its integration of small and large real-world examples, the worldwide best-selling text emphasizes problem-solving and design skills and introduces students to the process of constructing high-quality software systems. The 9th Edition features a sweeping overhaul of Graphics Track coverage, to fully embrace the JavaFX API. This fresh approach enriches programmers’ understandings of core object-oriented principles. The text uses a natural progression of concepts, focusing on the use of objects before teaching how to write them–equipping students with the knowledge and skill they need to design true object-oriented solutions. Also available with MyLab ™ Programming. MyLab Programming is an online learning system designed to engage students and improve results. MyProgrammingLab consists of programming exercises correlated to the concepts and objectives in this book. Through practice exercises and immediate, personalized feedback, MyProgrammingLab improves the programming competence of beginning students who often struggle with the basic concepts of programming languages. MyLab Programming should only be purchased when required by an instructor. 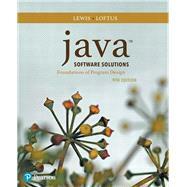 John Lewis is the co-author of the previous editions of the Java Software Solutions textbook, Java Software Structures, Java Foundations, and the Java Software Solutions textbook used for AP computer science classes.